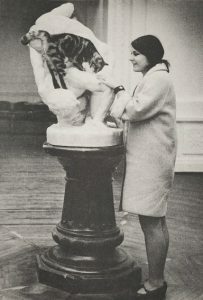 A custodian’s job can be a lonely one, but luckily for Jim (James) Alp, Sarjeant Gallery custodian 1963-1974, Mrs McSweeney the Gallery cat was always there. 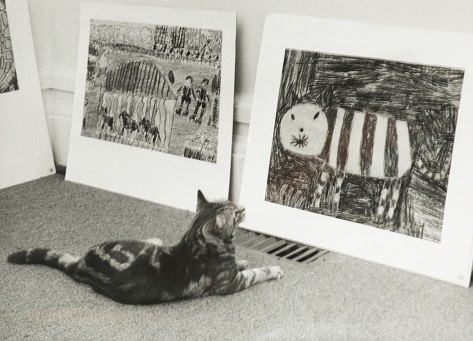 Unlike the elusive Macavity, McSweeney was visibly active in the day-to-day running of the Gallery. The multi-talented moggy greeted visitors at the door, patrolled the premises at night and monitored the heating of the gallery in winter. As muse she inspired works of art, and the drawing of a bone was tossed her way by artist Cliff Whiting with the message – “Bone for McSweeney. Sorry Jim no meat on it,”- on the back of his artwork, Ngāngara on display until 18 September in Revealed – Collection Discoveries from our recent move. Mrs McSweeney joined the staff of the Sarjeant Gallery Te Whare o Rehua Whanganui in the mid-1960s. 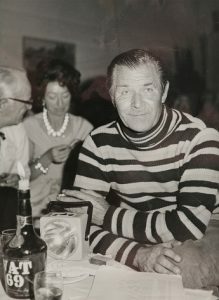 Grace Alp, Mr Alp’s widow, remembers her well. The grey, white and black tabby was one of their kittens. “She was very people conscious – well we were all honorary cats really. She quickly got into her duties, which were to supervise everything that went on and do a cat-scan of anything that was new,” Mrs Alp said. Mrs Alp taught in Whanganui East while her husband looked after the gallery, enlisting help from city council staff to hang the largest paintings. “In those days it was a matter of unpacking art works, hanging them, publicizing [the exhibitions] and then repacking – Jim did all of that. Dr Robertson [the director] took a progressively less active role.” She says there was a relaxed atmosphere in the Gallery, and a prevailing philosophy that “art was to be enjoyed by the many, not to be looked at and critiqued by the few.” During his time as custodian Mr Alp was a hobbyist painter, stimulated by all the major artists he encountered. Mrs Alp recalls how artist Para Matchett encouraged her husband to find his own signature theme and artistic medium. He chose cats and painted Mrs McSweeney. The Gallery has three of Mr Alp’s abstract paintings in the collection.